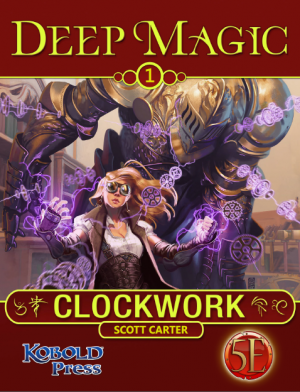 I got my Deep Magic: Clockwork, the just released magical tome that whirs and sparks when you dive inside. 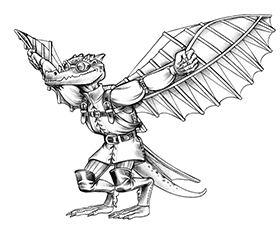 It’s now available in the Kobold store. When the Great Machine talks, great machinists need to listen. This book reveals new options for clerics, wizards, and warlocks in 5th Edition. Now, you get to be the golem. Are you steamed at the lack of timely new spells? Never spin your wheels again with indecision! No need to come in second. Just grease the wheels of your game with some well-timed spells in this up-to-the-minute compendium. Grind through monsters. Synchronize with your companions. Whir and… uh… oscillate—maybe?—with delight in the treasures you’ll win. You’re gonna get all wound up over this! Oh well done! Already teasing the wizard at our table with the prospect of new spells. Thank you! You have made my geek heart beyond happy!!! I cant wait to buy this and devour all its sweet sweet flavour. To anyone reading this announcement, buy this PDF. It is amazing. The three subclasses are amazing and the spells are just downright cool. I cant wait to play a clockwork mage sending my animated constucts out into the fray. Wonderful expansion for 5E. A really fresh feel to infuse into your tabletop game. I plan on adding a whole new planet for my campaign world inspired by this product. While this is a good PDF there are a few things that could use Errata or at least a clarification. 1. Armored Heart is listed as a level 1 bard spell and in the spell description it is listed as level 1, but for Sorcerers, Warlocks, and Wizards it is listed under 2nd Level. The spell from the description looks like a first level spell, especially when compared to the cantrip Blade Ward. 2. Gear Barrage is listed as a 3rd level Sorcerer spell and in its spell description, but as a 2nd level Warlock and Wizard spell. Compared to the Ranger spell Conjure Barrage, it looks like a 3rd level spell as per the description. 3. Not sure if this is intended or not, but the Cloud of Cogs Eldritch Invocation has a very limited level range where it is useful in that it lets you cast Gear Barrage using a warlock spell slot once per long rest, when that spell is already on the warlock spell list given that invocations are fewer than spells known for a Warlock. The only saving grace is that it does let you cast it earlier than you could learn the spell normally, so it is possible to pick it up at level 3 and then replace the invocation at level 5 when you can cast 3rd level spells normally, still a 2 level window of usefulness seems rather strange, when instead it could have been use a clockwork spell not normally on the Warlock list, like Animate construct for example. 4. For the Animate Construct spell, what is the movement of constructs animated with the spell? I’m guessing it is 30ft like with the animate object spell. But can specially created constructs have flight, swim, or burrowing speed other than relying on a DM having to make a judgement call? Are the ‘improvised’ constructs intended to have a slower movement rate or be just as fast as prepared ones? 5. In the Wizard spell list Robe of Shards is listed before Catapult in the 6th level, when alphabetically Catapult should be listed first. 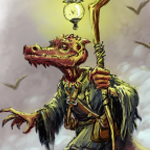 Where Would I be able to find statistics for the creatures in this pdf?